Let’s take a look at our recommendations on which water pumps are the best to use for your aquaponics or hydroponics setup. 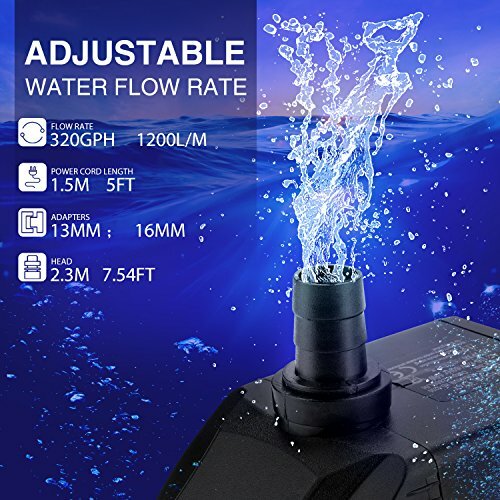 The Homasy Upgraded 400GPH Submersible Water Pump features a high-efficiency motor that produces a powerful flow rate at just 25 watts of input power. This motorized water pump can transport up to 400 gallons of water per hour and requires consistent energy as any loss in input energy can affect the flow rate. If you want to reduce the output of the device, simply connect the second, smaller nozzle included and you can expect less than 400 gallons per hour of output from the device. 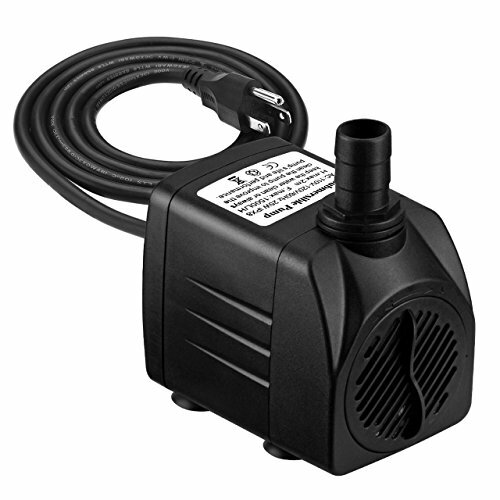 The KEDSUM 880GPH Submersible Pump produces a massive output of 880 gallons per hour and comes with an assortment of accessories, including a 4.9 foot power cord and a total of three nozzles for aquarium use. These nozzles reduce the output of the pump, so be sure to attach them directly to the line and make sure that the line is free of leaks before submerging the pump in the nutrient solution. Comes with an internal percolator that protects the ever-moving rotors from gunk and blockages. Perfect for hydroponics setups. The Simple Deluxe Submersible Pump produces a nominal 160 gallons per hour of push force when submerged in the water and comes with a 6 foot cord for extra long reach. This pump has also been equipped with a PRE-FILTER. A pre-filter is a special filter designed to prevent debris from invading the moving parts of the pump. Pre-filters reduce the strain on the pump and also improves the longevity of the pump. Since hydroponics pumps require recirculation and constant use, water pumps with pre-filters and other protective features that prolong the rotors and main motor are highly recommended. 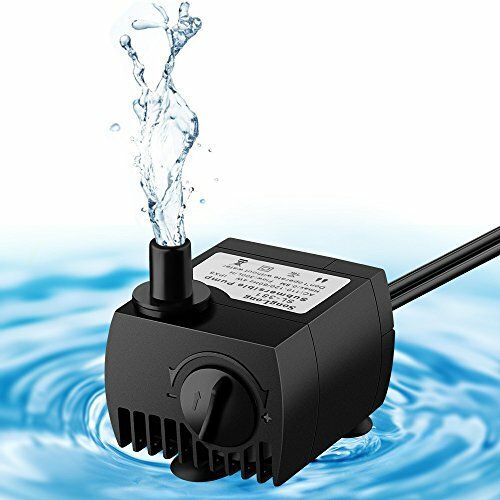 The VicTsing 80GPH Submersible Pump is a good option if you have a relatively small hydroponics setup, since it only pumps out an average of 80 gallons per hour. Can also be used for scaled down aquaponics setups, for the fish tank. One great upside of this energy-saving pump is it can deliver almost 2 feet of vertical push force while only using a total of 4 watts of power. 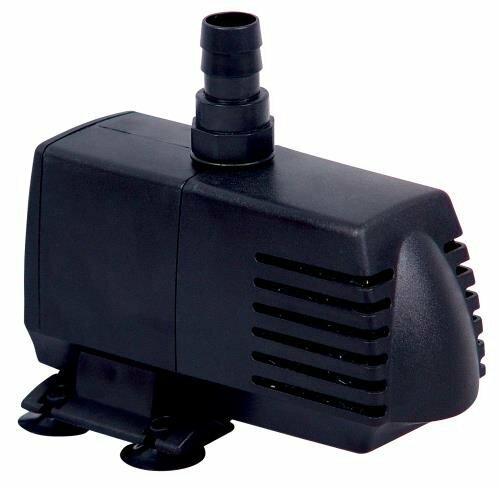 The HOUSE DAY Submersible Garden Water Pump packs a push force of 25 watts and is perfect for medium to large hydroponics or Aquaponics systems. This water pump can recirculate 320 gallons of water per hour and also comes equipped with two nozzles. The nozzles not only restrict or increase the GPH of the water pump but also help you fit the plumbing of your existing system better. The most common question that we get is about flow rate of course. When you already have the water pump and you’re aware of its power, just how much power do you need to keep your hydroponics system going? If you have a regular NFT setup, we recommend a flow rate of ½ to 1 gallon per minute for each channel in the system. One channel is essentially one pipe leading to the grow beds. The more pipes you have in the system, the higher flow rate needed to keep those pipes filled with water. Ideally, you should be able to fill your system with water within ten minutes. On the average, growers set their pumps to 30 to 60 gallons per hour, or a max of 120 liters per hour in conversion. What you should be extra careful of is over flooding your system and using more power than what is needed to make your system healthy and working. You don’t need to exceed what your system requires to recirculate the nutrient solution. An extremely fast-moving system does not necessarily mean that you will get the best results. In fact, there are even passive systems that don’t recirculate water at all, but rely on the natural reduction of the water through absorption and evaporation to improve the oxygenation process of the root mat of the plants. Now if you happen to have a growing station instead of a system for maturing plants, we recommend cutting the flow rate to half. So if your system has been set to run at 30 gallons per hour, cut it to 15 gallons per hour. When you have healthy plugs or mature plants, of course, you need to scale up the flow rate as more mature plants require more nutrients and recirculation is the way to do it. Now, let’s say that you already have a good idea of how much power you need for your system. Do you settle for the exact power or no? In our experience, it would be best to purchase a pump that has a higher capacity than what you actually expect your system to utilize. This is considered a best practice because there will come a time when your system will be scaled up, and once you do and the channels increase in your system, you will also need to increase the flow rate or GPH of your water pump. Another conservative method that we find important when you’re running a hydroponics system that actively requires recirculation day and night is to utilize more than two pumps at a time, and both of these pumps should have higher capacities than what they were intended for your system. Having two pumps working simultaneously will ensure that none of your pumps will be overworked. In the event that one of them breaks down, you will be able to substitute one pump, reconnect the other channels that once were connected to the pump that broke down and voila – your system is still alive. Since you have a higher capacity pump, you won’t be straining it too much in the process while you get the other pump replaced or fixed. 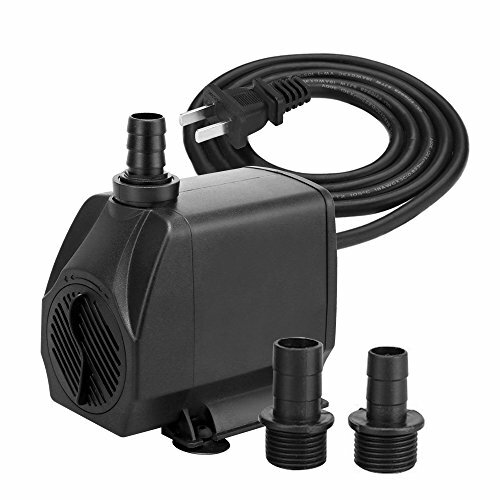 Now, the pumps that are being marketed to hydroponics growers are usually just regular submersible pumps. What do we mean by this? Submersible pumps have been around for decades and the technology has already been refined to the extent that water pumps now are far safer to use, utilize little power and can also be safely submerged in systems that involve flora and fauna. The usual problem that people encounter when they’re setting up their hydroponics systems for the first time and they connect their pumps is there is just too much water. How do you know that there is too much water? Check your grow beds, your drainage rate and if there are spills anywhere or over-flooding. When there is over-flooding, you either have to improve your drainage or reduce the GPH rate of your water pump. But then again, some pumps are more challenging to adjust especially if they are overpowered. So what do you do? Look at the box that came with your water pump. Do you see nozzles there? There are usually two nozzles that come with each water pump. The nozzles, as we’ve already shared with you, have two functions. First is to improve the plumbing connection between the pump and the new system. The second function of these nozzles is to change the flow rate. There is usually a smaller nozzle that you can use precisely for this purpose. Now, let’s say that you’ve already done that and you’ve also adjusted the gauge in the pump itself. You turn on the system and observe it for ten minutes or more. The grow trays begin to fill, but they are still overfilled to the point that you have spills on the floor. What do you do? There’s still one intervention in the design that you can do: go to the reservoir and the main connection between the tank and the pump. Replace the straight connection with a standard T-pipe and add a bit of rubber to reduce the opening of the connector. This will further reduce the flow rate without having to modify the pump itself. You will probably see immediate improvement in the flow rate of your system. And finally, let’s talk about maintenance. When you’re running a 24-hour operation with lots of stop and go sequences, your water pump will likely take a beating season after season. But there are ways to enhance the longevity of your system. One way is to inspect your system regularly to make sure there are no algae or molds in it. Molds will kill your pumps eventually. That is one type of gunk that can invade the insides of a water pump even if it has been installed with a pre-filter. Physical debris might not get in, the but the spores of water mold can. The second method is to just make sure that your pumps have been properly sized. If your hydroponics setup is too big for your chosen pump, then things can get awry after the first growing season. And now you’re really ready to begin installing your new pump. Happy planting!